The fact that I have been back from my holidays for over three weeks ought to mean that I have settled down into a proper routine by now, but I still seem to be operating on less than half-a-brain. I am finding myself enormously resistant to anything resembling hard graft on my research: I have reached a difficult bit so graft is necessary but instead my concentration wanders all over the place. 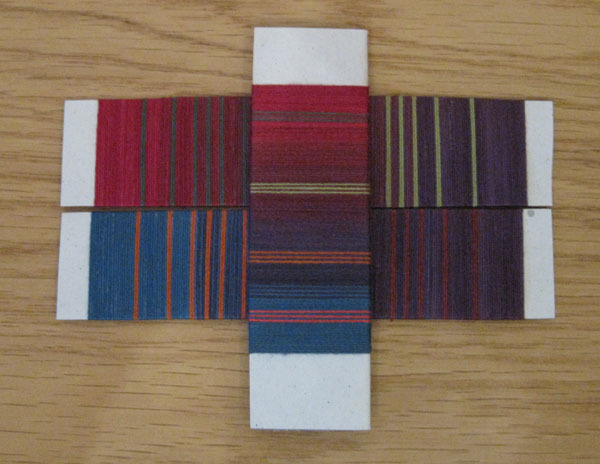 I am not suffering in this way with regard to my weaving, which — on the one hand — is a good thing because I am moving the serious scarves project forward, but — on the other — serves to make me feel guilty that the day job is not getting the same level of mental commitment. Can’t win! I did get an energy boost from a workshop I attended in July, but that has worn off alarmingly quickly… *Sigh* I know the second year is the classic doldrum-time for a PhD — doesn’t mean I am happy with it though! 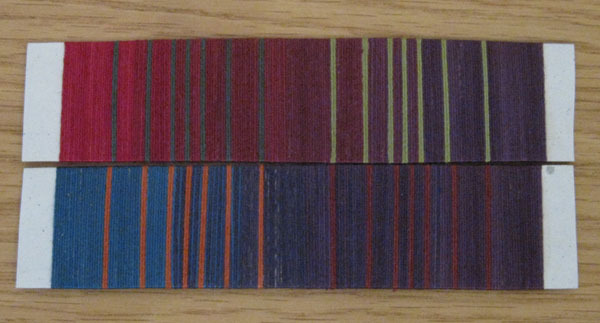 While these are quite plain and regular, I have scanned them in and can now play around with them on the computer, changing stripe widths, juxtaposing different colours and so on. I will also have a play in Excel. Much as I appreciate the power of Fiberworks in designing drafts, I don’t find it an easy environment for planning colour sequences. But speaking of drafts, here are two more huck samples on the loom. …it belatedly dawned on me that he was writing prior to the invention of synthetic dyes. All those hangings would have been dyed with natural dyes and his daily experience of yellow in clothing, art and so on would have been quite different from ours. Using up this last bit of warp has been surprisingly unpleasant. Ends kept snapping all over the place — which I took to be their protest at being suddenly flung back to work after a couple of idle months — to the point where I stopped trying to fix them and just wove to the end with a few gaps. I did say these were proof-of-concept samples, after all. 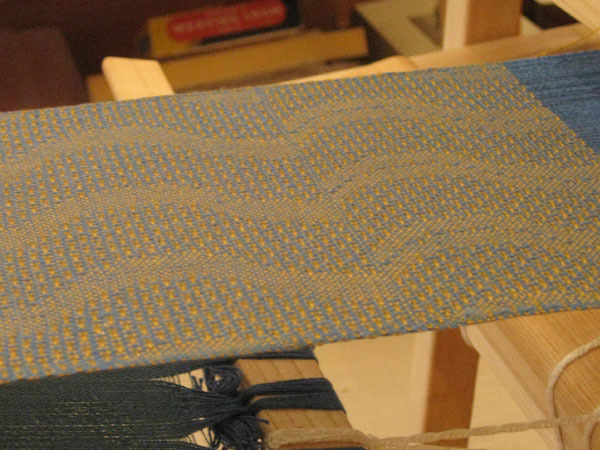 I also have to tackle an unrelated task: setting up some sample warps on table looms for next week’s guild meeting. 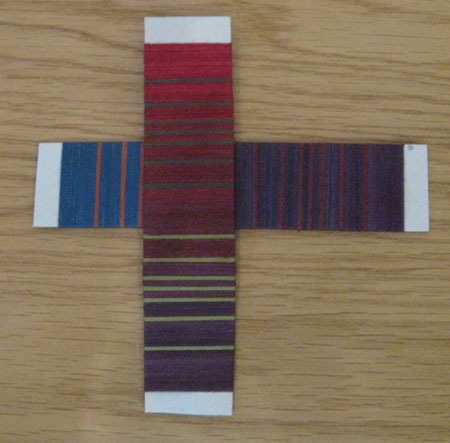 I am giving a talk and said I would prepare a couple of have-a-go looms to accompany it. As of this moment all I have ready for either part of this venture is a few scribbled notes, so I need to apply myself Quite Soon.